Figure 1. The inner Tree of Life comprises 7 types of regular polygons: triangle, square, pentagon, hexagon, octagon, decagon & dodecagon. Figure 2. The first (10+10) enfolded, regular polygons. Figure 3. 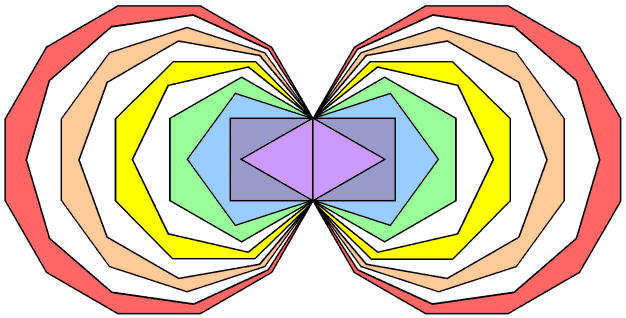 The 2nd-order tetractys character of the first 10 separate, regular polygons. If we take this analogy seriously, it means that the two sets of heptagons, nonagons & undecagons geometrically represent the Supernal Triad of Kether, Chokmah & Binah, which corresponds in some religions to the triple Godhead (e.g., the Christian Trinity of the Father, the Son & the Holy Spirit and the Hindu trimūrti of Shiva, Vishnu & Brahma) (Fig. 4). 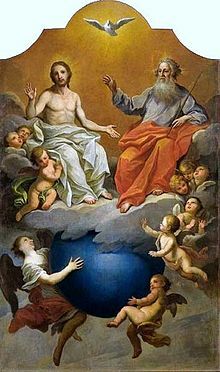 Holy Trinity, depicted by Szymon Czechowicz (1756–1758). 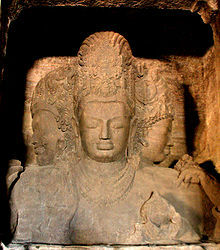 Hindu Trimūrti sculpture on Elephanta Island, near Mumbai, India. Figure 4. As will be proved in the following pages, the analogy between the 3 aspects of the Godhead and the 3 polygons absent from the inner Tree of Life is more than a formal one. Which polygon should correspond to each Person of the Godhead is an issue that need not be resolved at this point. The geometrical and yod compositions of the first 10 regular polygons are analysed in Article 58. 48 corners of the seven separate polygons → 48 yods lining the sides of (and intrinsic to) the seven 1st-order tetractyses. Table 1. Geometrical & yod composition of the nth-order N-gon. These formulae, which are derived in Article 65, may be used to determine below the global compositions of the three absent polygons when they are separate and when they are enfolded. Number of corners of their triangles ≡ Cn = ∑cnN = ∑[1 + ½(3n-1+1)N] = 3 + (27/2)(3n-1+1) = ½(33+3n+2). Number of sides of their triangles ≡ Sn = ∑snN = ∑½(3n+1)N = (27/2)(3n+1). Number of corners & sides = Cn + Sn = 30 + 2×3n+2. Number of triangles ≡ Tn = ∑tnN = ∑3n-1N = 3n-1×27 = 3n+2. Number of geometrical elements ≡ Gn = Cn + Sn + Tn = 30 + 3n+3, where "30" is the number of corners of the 27 sectors. Number of hexagonal yods ≡ Hn = 2Sn + Tn = 33 + 3n+2 + 3n+3. Number of yods ≡ Yn = Cn + Hn = ½(87+3n+4), where 87 is the number value of Levanah, the Mundane Chakra of Yesod. As n→∞, Yn/Gn→3/2. This is the arithmetic mean of the integers 1 & 2. In music it is the tone ratio of the perfect fifth, which is the primary division of the musical octave. This contrasts with Yn/Gn = 3/2 for all values of n in the case of the 7 enfolded polygons of the inner Tree of Life (see comment after Table 3 here). Number of corners ≡ Cn′ = Cn − 4 = ½(25+3n+2) = 2 + ½(21+3n+2), where "2" denotes the two endpoints of their shared side (the 'root edge'). Number of sides ≡ Sn′ = Sn − 2 = 1 + ½(21+3n+3), where "1" denotes the shared side. Number of corners & sides ≡ Cn′ + Sn′ = Cn + Sn − 6 = 3 + 21 + 2×3n+2, where "3" denotes the shared side and its two endpoints. Number of triangles ≡ Tn′ = Tn = 3n+2. Number of geometrical elements ≡ Gn′ = Cn′ + Sn′ + Tn′ = Gn − 6 = 3 + 21 + 3n+3, where "3" denotes the three geometrical elements making up the root edge. 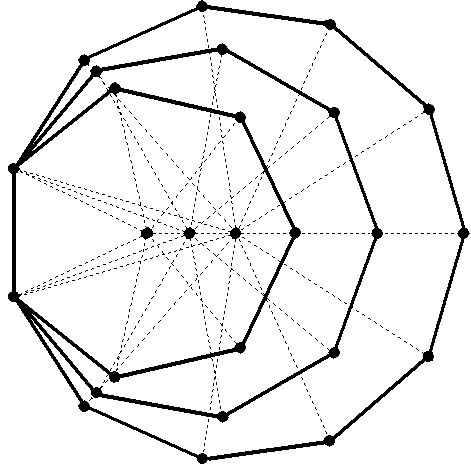 Number of hexagonal yods ≡ Hn′ = Hn − 4 = 2 + 21 + 3n+2 + 3n+3, where "2" denotes the two hexagonal yods in the root edge. Number of yods ≡ Yn′ = Yn − 8 = 4 + ½(63+3n+4), where "4" denotes the four yods in the root edge. The ratio of the number of yods outside the root edge to the number of geometrical elements outside the root edge = (Yn′−4)/(Gn′−3) = 3/2. The ratio is the same for every order of the three N-gons absent from inner form of the Tree of Life. This contrasts with the ratio of the number of yods and the number of geometrical elements in the 7 enfolded nth-order polygons of the inner Tree of Life being 3/2 for all n (see discussion after Table 10 here). As n→∞, Yn′/Gn′→3/2. We find that the tone ratio 3/2 of the musical perfect fifth is the asymptotic value of the ratio of the populations of yods and geometrical elements in the limit of infinite-order 7, -9- & 11-gons. Table 2. Collective properties of the three absent polygons. The next 10 pages will be devoted to explaining how the Kabbalistic Godnames of the 10 Sephiroth mathematically prescribe the properties of the three polygons absent from the inner Tree of Life — both separate and enfolded. The manner of their prescription is so natural that it ought to leave no doubt in an unbiased mind that the ancient Hebrew Divine Names operate at the level of Atziluth to determine the properties not only of the outer and inner forms of the Tree of Life (and, of course, all sacred geometries that are equivalent to them) but — amazingly — also the three polygons absent from the inner Tree of Life. The pattern of parameters that pervades holistic systems (see The holistic pattern) will then be shown to be embodied as well in these three polygons. This indicates that they must be understood as the abstract precursor within the Godhead of cosmic archetypes actualised in the seven Sephiroth of Construction by means of the seven types of regular polygons that make up the inner Tree of Life. Finally, this section will reveal direct, undeniable links between properties of the three absent polygons and group-theoretical aspects of superstring theory, which the pages of this website prove are represented in isomorphic sacred geometries like the Tree of Life, the Platonic solids, the Sri Yantra and the disdyakis triacontahedron.